Calling all teenagers quit the moaning and start loving life! Don't be a cliche. Don't stay in your bedroom grunting and grumbling. Calling all teenagers quit the moaning and start loving life! Don't be a cliche. Don't stay in your bedroom grunting and grumbling. How about getting motivated, energized and start making a difference?! 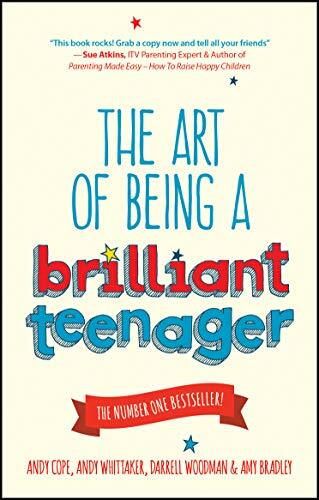 The Art of Being A Brilliant Teenager teaches you how to become your very best self and how to figure out who that is, exactly. The bestselling authors of The Art of Being Brilliant and Be Brilliant Everyday are experts in the art of happiness and positive psychology and, with this new book, you'll find your way to becoming brilliant at school, work, and life in general. Stay cool under all the pressures you're facing, and plot a map for the future that takes you wherever it is you want to go. Become proactive, determined, successful and most importantly: happy! Fact: your life span is about four thousand weeks. It seems like a lot, but it's not. Complaining about life, homework, parents, and relationships may be normal now, but don't let it become your defining trait. When you're forty years old and still moaning, a big chunk of your four thousand weeks have slipped by, and you're no closer to happiness than you were as a teen. This book is a guide to starting the journey to your ideal life now, instead of wasting time being a drip. * Discover the real you, and what you want out of life * Stop moaning and get moving now, while there's plenty of time * Lose your bad habits before they become your personality * Figure out how you want to contribute, and find a way to do it The bottom line is this: it's easy to be the average version of yourself, but is that really all you want? Don't you want to achieve something? Get started now. The Art of Being A Brilliant Teenager helps you figure out where you want to go, and how to get there. So, whether you're an ambitious teenager, a parent or teacher desperate to turn a down-beat teenager into a ray of positivity and delight, How to Be a Brilliant Teenager is here to help.